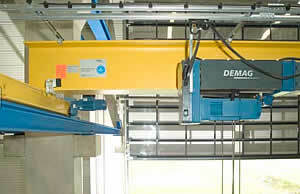 Compact dimensions for space-saving installation and maximum lifting height are characteristic for DR-Com rope hoists. The DR-Com rope hoist is the ideal hoist solution for applications which demand maximum safety and reliability, but where there are no other special requirements or no options are needed. All DR-Com hoist and trolley components are designed according to the FEM service life requirements for smooth, long-term operation. DR-Com units are available as single travelling hoists, as hoists for single and double-girder cranes and for stationary applications. The control system features processor or contactor control, as required. Exact positioning and handling without any load sway are provided by variable-speed operation via a cross-travel inverter for the processor-controlled variant. You also have the choice of controls: besides the variant with a cable-connected control pendant, our DRC-MP radio control system can also be employed.